Preheat oven to 350°F. Line cupcake pan with cupcake liners. Make and bake cupcakes according to package directions. Let cool. While cupcakes are baking, toast almonds in a skillet for 6-8 minutes or until golden brown. Let cool. Place almonds in a heavy-duty food processor and puree scraping the bowl often. Add milk and oil to help keep things moving. Process until almonds start to form a paste. Add brown sugar, salt, vanilla, and almond extract. Process until smooth. Add more sugar or milk if necessary. Let cool slightly if warm then stir in mini chocolate chips. Chill in refrigerator for 20-30 minutes or until firm. 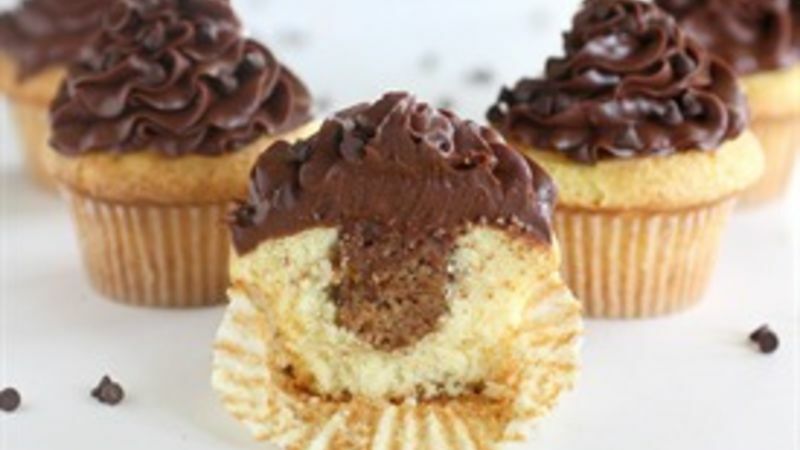 Once cupcakes are cool, cut a cylinder shape out of each cupcake and stuff with 1-2 Tablespoons of almond butter. Frost with chocolate frosting. I like to put the frosting in a plastic storage bag and snip off a nickel sized hole in one of the corners to pipe the frosting on in a cone shape. To fancy up your cupcakes, garnish with mini chocolate chip cookies. I used 1/4 of a package of refrigerated cookie dough. I placed nickel sized balls of dough on a cookie sheet and baked for 8-9 minutes at 350°F. Every once in a while, my husband brings home chocolate chip cookie dough cupcakes from work that are to die for! I have three problems with this: 1. I have yet to track down the recipe for the cupcakes. 2. Even though I don’t have the recipe, we know the dough stuffed in the cupcakes has raw eggs in it. Although I like to live dangerously, I don’t consider eating massive amounts of raw eggs the best idea (which is bound to happen because you know I can’t eat just one cupcake!). 3. They’re really tasty and whoever is baking them may be giving me a run for my money in the baking department. So the only logical thing to do was try to duplicate the recipe on my own! These Almond Chocolate Chip Cookie Dough Cupcakes came pretty darn close if not better to the ones my husband brings home from work.